Hello! I just got back from a short and sweet trip to Hong Kong. It's been sweltering and suffocating in Manila for the past month and the Hong Kong weather (cooler by at least 10 degrees - in Celcius) and rain, oh the rain, were such a much-needed respite. Sure, it's already past winter there and humidity has started to rise, BUT my two-and-a-half day stay was very comfortable. Comfortable, yes, because we were able to do a lot of stuff -- AND walk around 14 kilometers in one day! -- without sweating profusely. On the contrary, with this kind of heat in Manila, there's pretty much nothing we can do but vegetate inside air-conditioned rooms. And still sweat while in it. Ugh. So yes, the husband and I did a lot of walking, aka shopping slash malling. So much for tourist-y stuff, eh? :) And to compensate, we stuffed ourselves chock full with all the fresh and scrumptious dim sum and other Chinese food from restos all over. Mmmm, my mouth waters just thinking about it. But the highlight of our trip? Ahhhh, definitely the beauty-related "sight-seeing" and shopping! Some of my Hong Kong makeup and skincare loot. Hello there, new babies! Hong Kong, big malls and small shops alike, carry a lot of brands either not easily accesible in the Philippines or are available here but at such exorbitant prices. To say I had a field day just going through makeup and skincare counters was an understatement. I hopped on from one aisle to the other like a giddy little girl let loose in the candy store and ogled all those precious, wonderful little things. The city's beauty shops were a true paradise! Meet my gorgeous friend from THE Estee Lauder group of companies. Company Store! I DIE!!! I'll let you in on a little secret. I got access to THE Estee Lauder group of company's store. A rare pass, and a very special one. 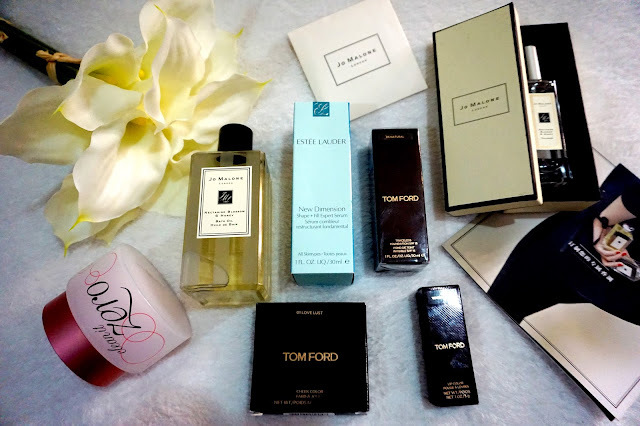 I mean, c'mon, I'm a HUGE fan of the brand (Estee Lauder) itself, plus the other brands in the group like MAC, Origins, Bobbi Brown, Clinique, AND something I've been dying to lay my hands on -- Tom Ford. Yes, ohmygolly, T-O-M F-O-R-D! I died and went straight to makeup and skincare heaven! I could have stayed there swatching and going through each products all day and I could have spent all our money on luxury makeup and skincare, but alas, real life implored me to do otherwise. I am a responsible momma slash woman, after all. I will be unboxing my makeup and skincare loot (among my other April goodies, which I have yet to open. tee hee) and will be sharing my thoughts on these new babies. Oh goody, I am one excited momster!